Last night was not looking promising, and I thought we would end up with takeout. I texted Steve as he was leaving the office around six, prompting him that I didn’t really feel like cooking, without explicitly saying so, then he texted me around eight-thirty, letting me know he was still on the train. Stuck. Because some measly branch fell on the tracks. Perfect. So, I figured if my hubby can, on top of an already crazy week for him, hold it together while stuck on a packed commuter train for three hours, surely I can make something for dinner. That something–an excuse for a salad loaded with tangy blue cheese and no-boil gnocchi–occurred to me during a little pre-dinner yoga. From the time I pulled that wedge of cheese out of the fridge to my first bite of salad, a mere 10 minutes elapsed. If you’re a regular NCK reader, you know I don’t easily slap the “quick dinner” label onto a recipe, what with its general overuse these days, but I knew that the quick prep and spectacular outcome of last night’s dinner necessitated that I post it on the blog, and fast. 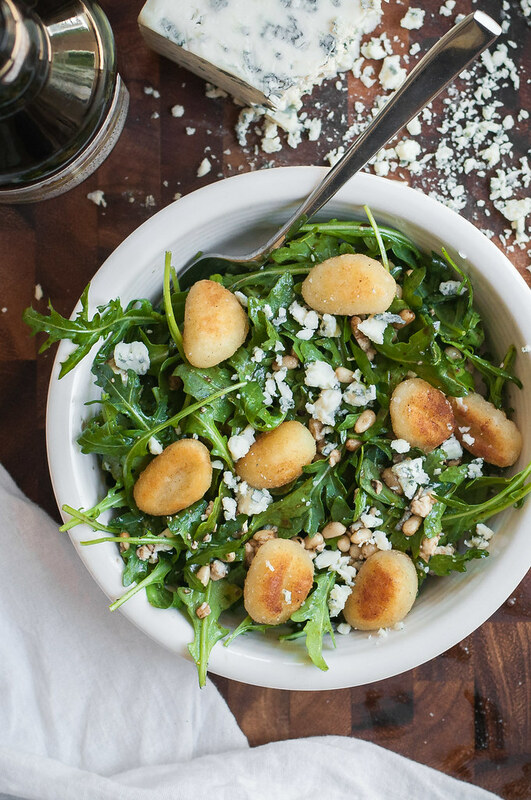 As I discovered in an equally cheesy recipe, cooking gnocchi doesn’t mean lugging a pot of water to the stove, and that is the secret to the speed of this comfort food salad. Another convenient feature which I noticed after-the-fact? You can get all the ingredients in one stop without having to run around town looking for anything fancy. I recommend Trader Joe’s if there’s one near you–the price/quality combo cannot be beat. 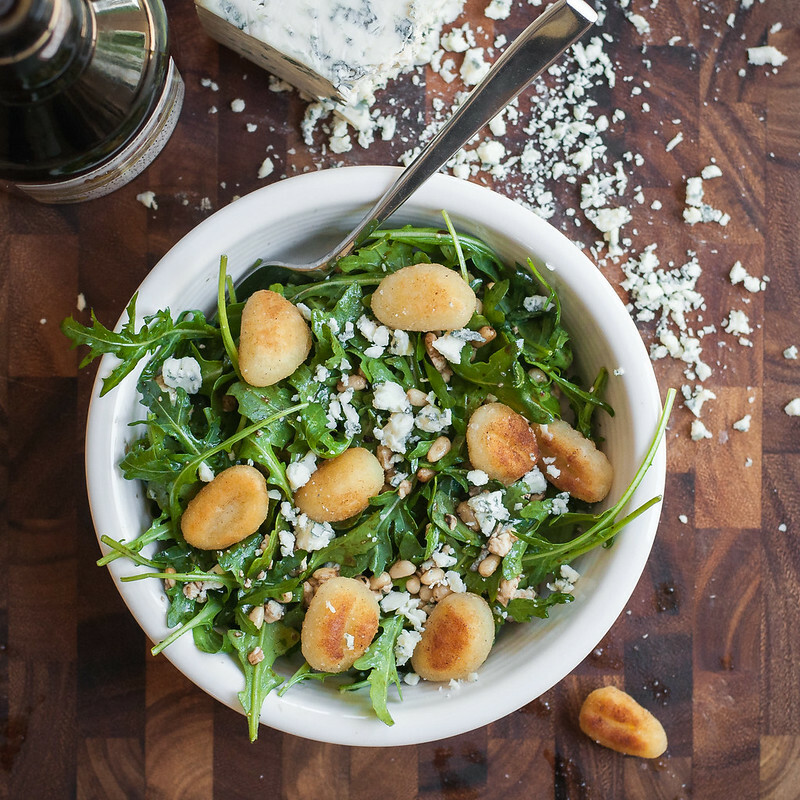 They have your arugula pre-washed, pine nuts at a reasonable price, a well-balanced, reliable gorgonzola that crumbles like a dream, and oil and vinegar that far exceed expectations for the price. Every time I restock my olive oil, I’m tempted to buy them out…but then I gather myself and subdue my hoarding instincts. The summer does not promise to slow down, and it’s filled with exciting, challenging, and fun things: birthdays, breweries, babies, photography, Boston, Minnesota, baptisms, bridal showers, learn-to-cook parties, family visits, and beach days! That’s a lot of “B” things–strange. Oh, and one more–hopefully plenty of brunch. As such, I’m sure there will be plenty more weeks of barely existent dinner planning, and lots more 10-minute dinner recipes on the blog. Stay tuned! A 10-minute main dish comfort food salad with no pot of boiling water needed. The recipe serves two, but quantities are highly flexible and can be adjusted for one or for a crowd, and also increased or decreased to taste. The salad would also be good with the addition of your protein of choice (such as cooked lentils, some quinoa, steak, or chicken). Heat oil just above medium heat in a skillet (I used cast iron). When hot, add the butter and melt completely. Add the gnocchi to the pan, stir to coat in oil, then let fry about 3 minutes while you prep the other salad ingredients. Flip gnocchi over once golden brown on the first side and let cook a few more minutes. Remove from pan and sprinkle with salt. While gnocchi fry, crumble the gorgonzola. 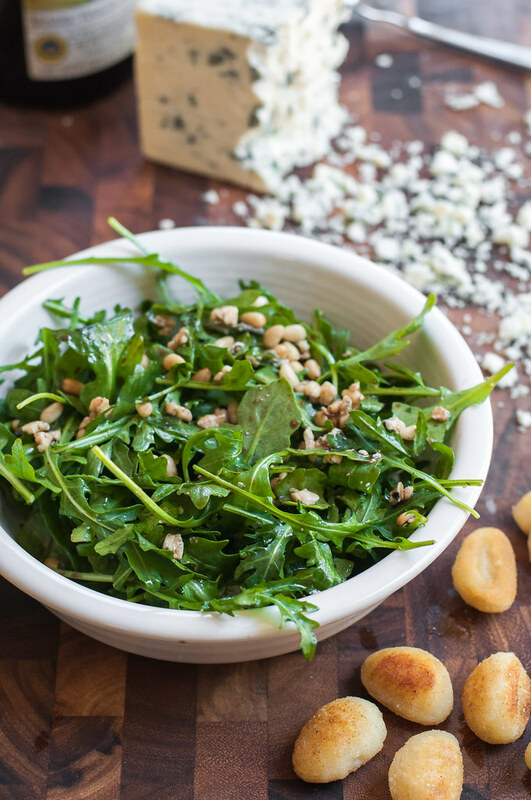 Toss arugula, most of the blue cheese, and the pine nuts with olive oil to coat. Then add a splash of balsamic and toss to combine. 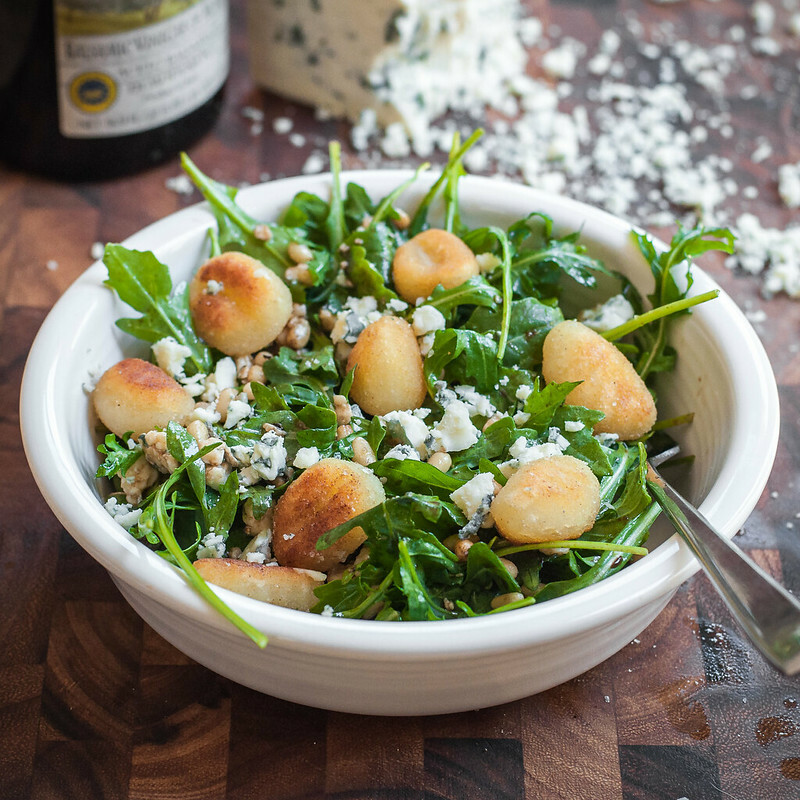 Distribute greens mix evenly amongst bowls and top equally with cooked gnocchi and remaining gorgonzola. Sprinkle with black pepper to taste. Note: This page contains affiliate links. It does NOT contain sponsored content. Affiliate links (to products I recommend, on Amazon) offset my ingredient and website maintenance costs, so I can keep bringing you speedy recipes like this one. Thanks!